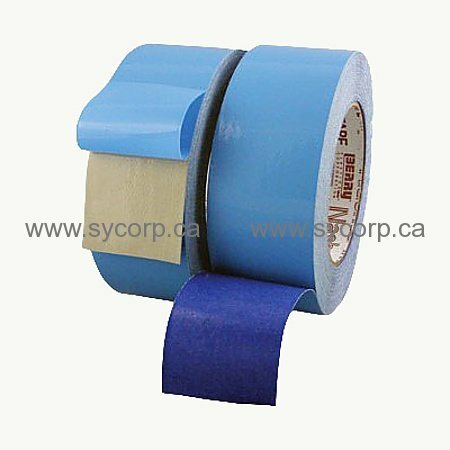 Nashua CleanDrape Double-Sided Abatement Tape has a multi-layer cloth & paper construction which provides the strength of a duct tape with the clean removability of a painters masking tape. Used to hang poly sheeting to a variety of surfaces such as wood, glass, aluminum, plastics, and vinyl during painting, sanding, construction, remodeling, mold and asbestos abatement applications. Its blue side offers clean removal for up to 14 days on a variety of surfaces such as drywall. Rubber-based adhesive provides a strong bond to poly sheeting. CleanDrape is also hand tearable and durable like duct tape. Clean Drape Tape, 2 inch x 20 Yard. 24 per case. Uses: Secure tarp or poly sheeting materials to wood, glass, aluminum, plastic and vinyl surfaces.